Now that the iPad is shipping, it’s time for another journey down the virtual isles of iPad cases. Manufacturers have continued a steady stream of case announcements since our first and second iPad case roundups, so here is a third for your accessorizing pleasure. Cases are once again organized alphabetically by manufacturer name. Acme Made: The Slick Case is a $40 full-zipper style case that allows the iPad to be used while still strapped into the case. The Skinny Sleeve is a $30 neoprene sleeve with a sewn-in screen guard. Belkin: Belkin is back with a slew of new cases and alternatives versions of some of its sleeves from our first iPad case roundup. The Cap Sleeve is a knit sleeve with elastic closure available in Perfect Plum and Black, though it’s sold out right now so no price is listed. The Grip Swell, Grip Groove, Grip Vue, and Grip Ergo are textured silicon sleeves available in black, vivid blue, and royal purple, though they too are sold out for now. Coming soon are the Leather Folio, a $60 leather case with microfiber lining, the Envelope, a $50 faux leather case with a “button and string closure” motif, and the Leather Sleeve, a $60 premium leather case that allows the iPad to be used while inside. DODOcase: The DODOcase is inspired by the popular Moleskine journals and organizers. It's hand made in San Francisco using traditional book-binding techniques, and the cover can flip around to act as a stand. It’s $50 and delivery takes four to six weeks. Draw: The drawCase for iPad is a unique hard shell for transportation, machined from “a solid block of recycled aircraft grade aluminum.” It’s lined with protective foam and will be available in a variety of rainbow-riffic colors that are still being finalized. No price or launch date have been announced yet, but you can sign up to be notified once the company is ready. GelaSkins: This big player in the artful gadget skins scene has quite an eclectic gallery of iPad GelaSkins available. These are $30 full body skins that cover the front bezel and back of the iPad, and they even come with an accurately proportioned wallpaper for the iPad’s display to complete the outfit. iPadSock.net : Remember Apple’s iPod socks? iPadSock.net is super-sizing them for the iPad and even replicating the colors Apple used back in the day on its (no longer sold) socks. You get a choice of nine slim fitting sleeves that each sell for $15 with free shipping. Marware: The Eco-Vue for iPad is a $45 “eco-leather,” folio-style case. The cover can be folded over into a couple stand options, similar to those offered by Apple’s iPad Case, but the Eco-Vue also has an elastic hand strap for easily holding the iPad while walking around with it. The Eco-Flip for iPad is another $45 eco-leather, vertical-folio case that offers mostly the same features and design as the Eco-Vue, save for the vertical flip cover versus a horizontal cover. The Sportfolio Bandit for iPad is a $35 neoprene sleeve available in three colors. It sports (hah! get it?) an elastic band for easy carrying and an outside pocket for trinkets. 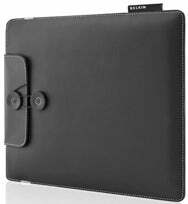 Piel Frama: This premium case manufacturer offers a handcrafted leather folio iPad case for $149 with your choice of magnetic or snap closure mechanisms. The case is available in a variety of leathers, has one document compartment, and has a cover that can be folded over as a stand similar to Apple’s iPad Case. Proporta: The Mizu Shell is a $40 “super tough” silicone case that “fits your iPad like a glove,” available in charcoal, red, and blue. The Aluminum Lined Leather Pouch is a $53 open-top leather sleeve with a sheet of aluminum slipped in the front to protect the iPad’s display, and faux fur lining to protect the body. The Maya II Pouch is another $30 open-top pouch made of "the finest alternative to leather." It comes in pink, white, or black, and features a scratch-free lining. The Tilt Stand is a $52 polycarbonate case with a built-in stand, allowing the iPad to be propped up in portrait orientation at various angles, or in landscape to act as a photo frame. Proporta’s Leather Case is a $48 leather folio case that can prop up the iPad in landscape orientation. The Leather Style Case is a pouch-style, $38 case available in black, brown, or red, while the Profile Hard Shell, available in the same colors for $34, is a polycarbonate case with a leather coating for textured hold-ability. Of course, no iPad accessory line as broad as this is complete without something like Proporta’s Advanced Screen Protector, which runs $23 and, interestingly, can apparently be washed and reapplied. Sena Cases: This premium leather case maker announced four cases available for pre-order. The UltraSlim is exactly that: a $60 ($51 on pre-order sale) pouch style case available in a wide variety of colors with an open top for easy iPad removal. The Executive Sleeve, available in black, brown, or red, is a $100 messenger sleeve ($80 on pre-order sale) with velvet lining and a secure flap with a magnetic closure. The Folio, also available in black, brown, or red, is a $100 ($80 on pre-order sale) vertical folio case with slots on the inside for carrying credit cards and a clever latch that can flip around and double as a kickstand to prop up the iPad. Sena’s Zipbook, available in the same three aforementioned colors for $100 ($80 on pre-order sale), is a clamshell case with zipper closure and an integrated kickstand. Simplism: The Silicone Case Set goes for $30 in a range of colors, and includes a screen protector and silicon case with four built-in feet for raised, stabilized iPad use on flat surfaces. The Shoulder Leather Case, available in a variety of colors for $60, offers a removable strap for easy carrying, while the Flip Leather Case offers a similar design sans the strap mechanism for the same price. Simplism also sells Protector Film in anti-glare and crystal clear flavors for $17 each. Speck: Popular Apple accessory maker Speck finally makes our iPad case roundup with the PixelShield, a $40 neoprene vertical carrying case with handle. The PixelSleeve Plus is a $40, messenger-style sleeve sporting a neoprene construction and carrying handle. Speck’s ShieldView screen protectors, $25 for a two-pack, break away from the crowd by using a static-cling approach instead of adhesive. The company also offers other products on its iPad page that have yet to receive dedicated pages or pricing, such as the Fitted for iPad and CandyShell for iPad, the latter of which appears to have a fold-up door at the bottom of the case so that the iPad can easily sit vertical on Apple’s dock without forcing you to remove the case. Sprint: Yep, you read that right. The wireless carrier is quietly quipping asking "Who needs an iPad 3G" with this new case for iPad users who don't feel like buying mobile data from AT&T. Sprint advertises that its Overdrive "portable hotspot" is a great companion for the iPhone and iPad, so now it offers the 4G Case that makes carrying an iPad and Overdrive together convenient. No price is listed for it right now because, for a limited time, Sprint is offering the case for free when you buy an Overdrive from a Best Buy in select US states. Vaja: Making its third appearance in our iPad case roundups with yet another round of case announcements, Vaja builds premium, customizable leather cases for a variety of gadgets. In addition to its Retro Slim Jacket and ivolution Top and Top SP cases, the company now offers more variations on its sleeve designs with the ivolution Stripes (starting at $220), ivolution Crystal 2 (starting at $350), ivolution GT (starting at $190), and ivolution Black & Lime (starting at $150), each of which ships in around 35 days. Vaja also offers the simply named Messenger Bag for $280, shipping now. We would link these each of products directly, but Vaja’s site design prevents that. You’ll just have to use the iPad link under Products. XGearlive: This accessory maker appeared in our second roundup with the $50 Shadow for iPad but has since released a slew of other cases. The Pad Shield is a $30 shock-absorbing shell with cutouts for docking, dust shields for button protection, and four colors to choose from. The Blackout is another $30 protective shell with a smoke black finish and stabilizing feet for using your iPad on a flat surface. The Silhouette for iPad in Black or Red is a $40, low-profile protective shell wrapped with leather. XGear also offers Private Eye privacy film for the iPad’s display in four-way ($60) and two-way ($40) angles, depending on how paranoid you are about people sneaking a look over your shoulder.